Kevin Goodman's book describes what happened to him and his group of friends after they first visited Warminster in the mid-1970s. 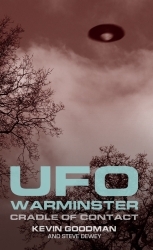 They began visiting Warminster to research the UFO sightings that had been occuring there for over a decade. Soon, to their suprise, they were to find themselves at the centre of the very phenomena they were researching. So popular has this book been, we are now at the third edition.